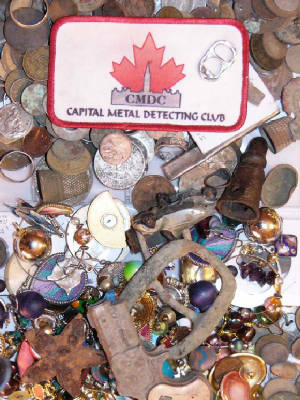 Capital Metal Detecting Club (CMDC)is a club devoted to the hobby of metal detecting for coins and other historical or cultural artifacts. We are also committed to abide by our mission -- a code of conduct and ethics which is detailed below. Our members are located in Canada's National Capital Region of Eastern Ontario and Western Quebec. This is notably the Ottawa, Ontario, and Gatineau, Quebec area. We also have members from other regions of North America and other countries around the world. The annual membership fee is $5 Canadian payable to our Treasurer who is listed below. We enjoy a breakfast meeting on the second Sunday of every month -- at 8 a.m. in the summer and at 9 a.m. in the winter. Currently we are meeting at Nate's Deli, on Wellington opposite the Bytown Movie Theatre and just west of King Edward. Throughout the year we enjoy group hunts and competitve hunts.